Charlotte, N.C. July 10, 2013 – Electrolux today announced that it is donating 1,000 air conditioners to needy individuals and families in four Southeast communities in which the company operates. The window air conditioning units will provide relief to those affected by high summer temperatures. The company is sending an 18-wheeler truck loaded with air conditioners across the Southeast, making donation stops in Charlotte, N.C., where Electrolux North America is headquartered, and in Anderson, S.C., Memphis, Tenn., and Springfield, Tenn., where it has manufacturing facilities. The company, which sells these air conditioning units under its Frigidaire brand, manufactures cooking, laundry, dishwashers, refrigerators and freezer products. In each community, the company is partnering with a local nonprofit organization to distribute the air conditioners. Each organization will help ensure the units are quickly distributed to those in need. The total Electrolux donation is valued at nearly $150,000. Electrolux is a global leader in household appliances and appliances for professional use, selling more than 40 million products to customers in more than 150 markets every year. The company focuses on innovative solutions that are thoughtfully designed, based on extensive consumer insight, to meet the real needs of consumers and professionals. Electrolux products include refrigerators, dishwashers, washing machines, cookers, air-conditioners and small appliances such as vacuum cleaners sold under esteemed brands like Electrolux, AEG, Eureka and Frigidaire. In 2012 Electrolux had sales of $16.3 billion ($4.6 billion in North America alone) and 58,000 employees. 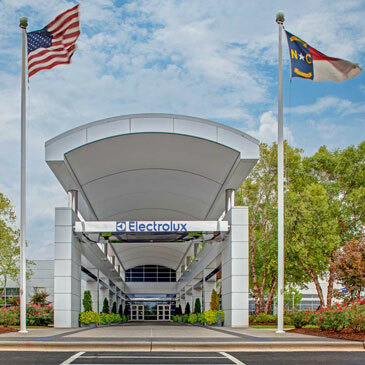 The Electrolux North American headquarters is located at 10200 David Taylor Drive, Charlotte, NC 28262 in University Research Park, where they have been based for two years. For more information go to www.electrolux.com/press and www.electrolux.com/news/.